This quilt is of hand pieced hexagons randomly placed and stitched on to a linen backing. They are mainly dress fabrics and chintz with some hexagon flowers in the centre and corners in broderie perse. There is no padding. 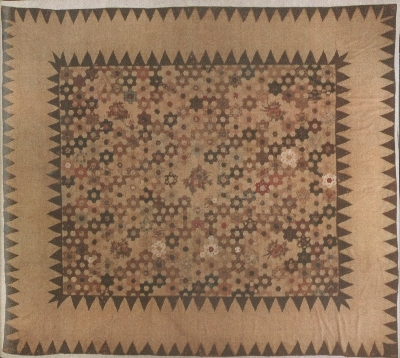 The quilt is believed to be English c. 1830 and was brought here pre 1970. It is now in the collection of Annette Gero.